Join us from any location, on your own schedule, for a 3 part Online Video Course on the fascinating subject of Or Nué. Our online classes allow students to learn at their own pace, as there is no deadline for viewing material. And after you finish watching the videos for the first time, you will continue to have access to them to refer back to. Our online courses cost a little more than our live, group setting classes because students will have continued access to the curriculum, access to print outs and links, and of course we need to be able to pay a company for the service of hosting all these wonderful videos. This obscure embroidery technique uses glittering gold and vibrant shimmering silk to paint a picture in thread. Or Nué dates back to the medieval era where it was used primarily in religious vestments and altar cloths. 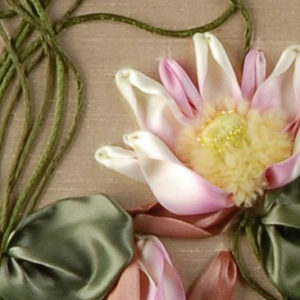 Today we can use the technique to create beautiful artwork or even exquisitely detailed jewelry! No prior embroidery experience is necessary, but patience and a willingness to work in a small scale is helpful! 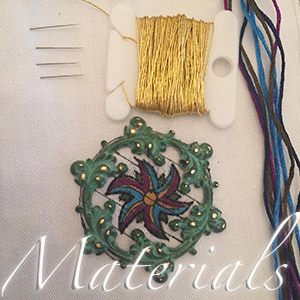 I have been teaching beading and embroidery classes since 2000, but I am now making the big leap of offering my classes online. 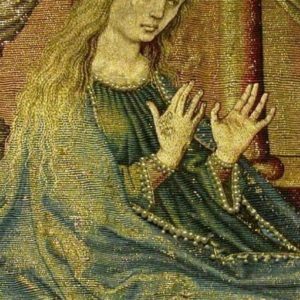 Help me get the ball rolling and spread the love for historical and couture beading and embroidery arts by registering for my class in advance! I am offering a limited time Early Registry Pricing option for students to save $50 by signing up before all the content is live. The first video lesson is already live and lesson 2 will follow shortly! There will be 3 video segments total. Students will need to purchase their own materials for the online classes. This listing covers the instruction only. Chapter Two of our series will discuss materials and provide a detailed supply list. If you have taken one of my live, group Or Nué classes in Columbus, Ohio, you are eligible for a discounted price for this more in depth course. Just send me an email with your name and receipt, and I will send you a discounted invoice for the online course. All online class sales are final. Questions or comments may be directed to: sales (at) oldetownebead (dot) com .